Log amplifier is a linear circuit in which the output voltage will be a constant times the natural logarithm of the input. The basic output equation of a log amplifier is v Vout = K ln (Vin/Vref); where Vref is the constant of normalisation, and K is the scale factor. Log amplifier finds a lot of application in electronic fields like multiplication or division (they can be performed by the addition and subtraction of the logs of the operand), signal processing, computerised process control, compression, decompression, RMS value detection etc. Basically there are two log amp configurations: Opamp-diode log amplifier and Opamp-transistor log. 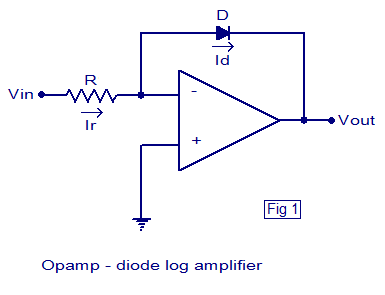 The schematic of a simple Opamp-diode log amplifier is shown above. This is nothing but an opamp wired in closed loop inverting configuration with a diode in the feedback path. The voltage across the diode will be always proportional to the log of the current through it and when a diode is placed in the feedback path of an opamp in inverting mode, the output voltage will be proportional to the negative log of the input current. Since the input current is proportional to the input voltage, we can say that the output voltage will be proportional to the negative log of the input voltage. Where Id is the diode current, Is is the saturation current, Vd is the voltage across the diode and Vt is the thermal voltage. Since an ideal opamp has infinite input resistance, the input current Ir has only one path, that is through the diode. That means the input current is equal to the diode current Id.